From I-49, take the Pont Des Mouton exit and turn west. Travel to the traffic light and cross over N. University Ave, where Pont Des Mouton becomes Lebesque Road. Travel down Lebesque Road and take a left onto Brothers Road (Hwy 723). After the stop sign, continue traveling and Morvant Precast Concrete Products, LLC is located on the right. **Recommendation: Lebesque Rd. is very narrow, and large trucks may have difficulties traveling down this road safely. Large trucks taking the I-49 route should take a left from Pont Des Mouton onto N. University Ave and travel south to Renaud Drive. Take a right onto Brothers Rd (Hwy 723). 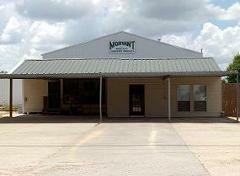 Morvant Precast Concrete Products, LLC is located on the left. From I-10, take the N. University Ave exit and turn north. 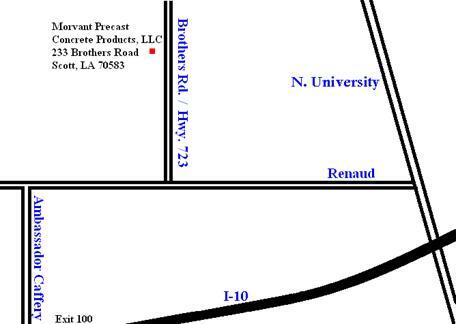 At the caution light, take a left onto Renaud Dr. Take a right onto Brothers Road (Hwy. 723). Morvant Precast Concrete Products, LLC is located on the left. From I-10, exit Ambassador Caffery–turn North. Travel until the road comes to a T, and take a right onto Renaud Drive. Take a left onto Brothers Road (Hwy. 723). 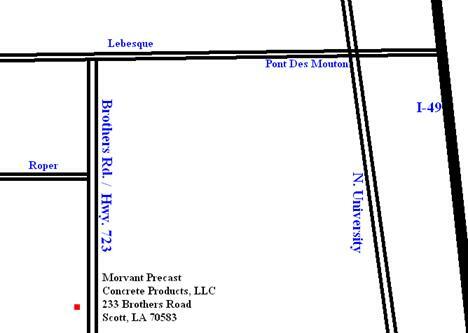 Morvant Precast Concrete Products, LLC is located on the left.